The average U.S. home has 300,000 things. We lose ten minutes every day searching for things. We can reduce our housework by an average of 40% by reducing clutter. American children make up 3.1% of the world population, but consume 40% of all toys globally. Women in particular have higher cortisol (stress) levels when they live in cluttered homes. Unfortunately, I suspect that my home has slightly more than 300,000 things. I’ve always tried to be a bit above average, but in this case, I failed while succeeding. Clutter can become so overwhelming that it is hard to gain momentum even when we want to clean it up. When clutter is everywhere it’s paralyzing. It is hard to decide where to start. Personally, I need to see some immediate wins. I need to see progress in order to maintain the momentum. After becoming overwhelmed I came up with an idea that is working for me. Here is how I’m conquering the clutter. I decided to make my daily path through my home a clutter free zone. The idea is to start with your bedside and then move on to the next place you go when you roll out of bed. After that, move on to the next until you have cleared your morning path of clutter. This may take days or weeks to complete, but clear that path a little further every day. Expand from there once you have traction in your normal path of travel. It’s still a work in progress in my home, but so far I’m feeling good about it. Here are the first three areas and I’m gaining momentum. I first de-cluttered my nightstand. It’s nice to start the first few minutes of the day with zero clutter. I didn’t just clean up the random items next to my bed. I took it to the next level. I removed my alarm clock for example. I now use my phone for my alarm. Think outside the box and find ways to reduce redundancy. I removed the trashcan that was next to my bed. It seemed normal to have a trashcan there, but we had four trashcans within about a 15 foot radius of my side of the bed. Was walking 15 feet to a trashcan really so much effort that I needed one even closer? Apparently. I moved on to the bathroom counter. While many of the items I had on my bathroom counter weren’t clutter, they still cluttered up the area. To clear the counter I had to handle the true clutter in the cabinet beneath the sink and the bathroom drawers. I’d estimate that over half of the stuff in the cabinet and drawers went to the trash with no hesitation. Some of it was literally trash (old receipts, expired medications, etc…). Now, the things I do use are in the drawer and my counter top is nearly clear of everything. I left out a shaver, a bottle of soap, and my toothbrush. A counter top with almost nothing on it is refreshing and lifts my spirits every morning. Next I attacked the clothes closet. I had already started reducing my clothes, but I did a deep cleaning of the closet. We had ripped suitcases that we never used (because they were ripped). Not sure why we kept them. Anyway, a large number of items went to the trash or goodwill. Our closet is now so roomy the dirty clothes hampers fit in the closet instead of the bathroom sink area. Wow, even more space to sooth the soul. Now I spend the first hour of my day in a pretty clutter free zone. It gives me a little extra boost to tackle the day. My next objective is to downsize my clothes dresser. I have reduced my clothes to the point that they all either hang in the closet or can fit into a single drawer. More calm and open space coming to my path very soon. 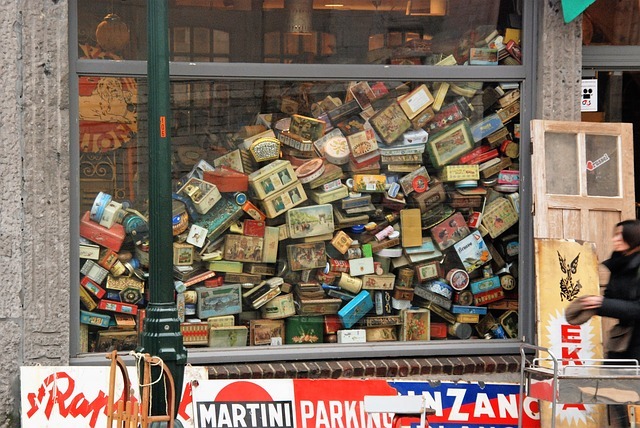 In what ways have you learned to tackle the overwhelming clutter in your daily life? “ Quotes About Clutter (59 Quotes) .” Goodreads. Accessed January 31, 2017. http://www.goodreads.com/quotes/tag/clutter. “A Fine Mess: Why We Need to Ditch the Clutter.” The Huffington Post, July 9, 2012. http://www.huffingtonpost.com/shannon-kelley/clutter_b_1656670.html. “For Many People, Gathering Possessions Is Just the Stuff of Life.” Latimes. Accessed January 31, 2017. http://articles.latimes.com/2014/mar/21/health/la-he-keeping-stuff-20140322. “Free Image on Pixabay – Junk Shop, Clutter, Antique.” Pixabay. Accessed January 31, 2017. https://pixabay.com/en/junk-shop-clutter-antique-vintage-1561897/. Hirsch, Holly. “Clutter Facts and Organizing Tips.” Amazing Good Will. Accessed January 31, 2017. http://www.amazinggoodwill.com/living-amazing/bid/201877/Clutter-Facts-and-Organizing-Tips. “Lost Something Already Today? Misplaced Items Cost Us Ten Minutes a Day.” Mail Online, March 21, 2012. http://www.dailymail.co.uk/news/article-2117987/Lost-today-Misplaced-items-cost-minutes-day.html.